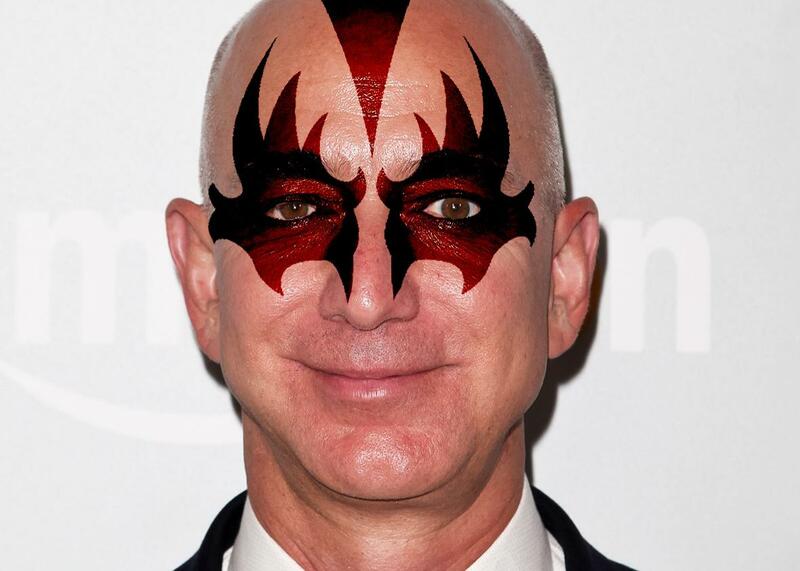 What Jeff Bezos presumably feels like on the inside these days. Photo illustration by Slate. Photo by Tibrina Hobson/Getty Images. The Washington Post unveiled a cheery new motto this week: “Democracy dies in darkness.” The phrase now appears beneath the newspaper’s name on its website and Snapchat Discover page, although it has yet to make its way into the print edition. I think a lot of us believe this: that democracy dies in darkness, that certain institutions have a very important role in making sure that there is light. And I think the Washington Post has a seat, an important seat, to do that, because we happen to be located here in the capital city of the United States of America. In Bezos’ mind, then, the motto is really about “making sure there is light.” Still, it’s hard to shake the sense that we’re reading dispatches from the end times with those three D-words looming atop the paper’s home page. The grim action verb, the present tense, the dunh-dunh-dunh alliteration, the foreboding final word: Cormac McCarthy, take notes! Far be it for us at Slate to chide fellow journalists for apocalyptic responses to our present political predicament. That said, we can imagine that the backlash and mockery might give the Post’s executives pause as they ponder putting the motto on their subscribers’ doorsteps every morning, and we’re here to help. Should Washington’s paper of record decide at some point that it wants to strike a slightly gentler tone, here are 15 classic metal album titles that might fit the bill.